This student project was created in order to promote the unique features that Spotify offers. I was challenged to develop unique graphic transitions, while maintaining brand consistency. The goal of this project was to create a video that would increase the number of Spotify Subscribers. "Create a captivating promo for a brand." As an avid Spotify user myself, I wanted to cut and edit a promotional video that would highlight the video segments that are exclusive to Spotify Premium members. I worked to apply motion graphics to different footage from Spotify's YouTube channel, and create an exciting video. Wanting to represent Spotify in an authentic way, the primary research consisted of looking through brand guidelines and finding identifiable color palettes. While researching, I wished to find a combination of styles that would help the viewer recognize the brand within the first seconds of the video. One of the greater challenges I was faced with, was how to properly navigate a promotional video while staying true to the brand. 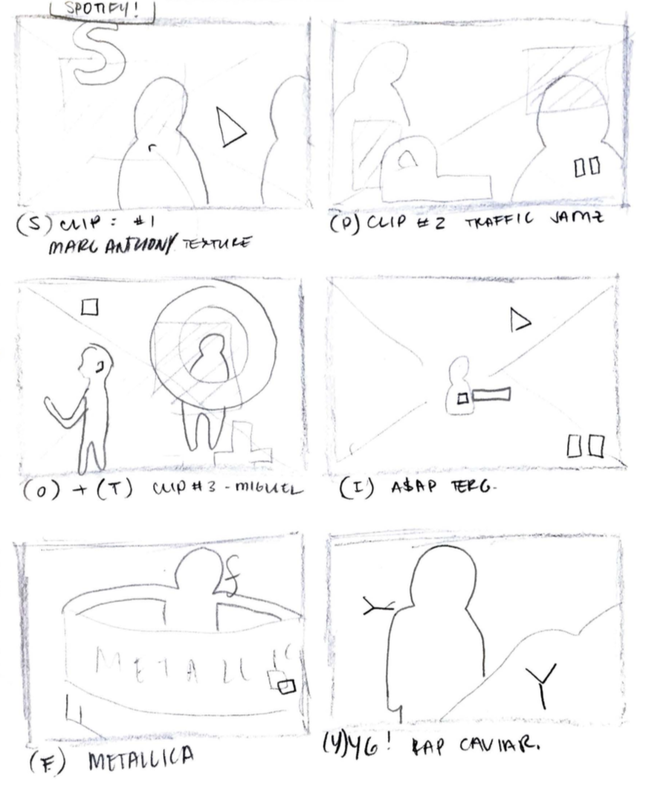 Through iterations within storyboards, I was able to ideate some ways to highlight Spotify features while executing a high-energy style. *PLEASE NOTE: Footage was sourced from Spotify's youtube channel.